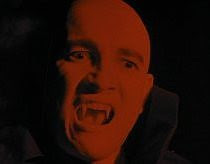 Ronald Remy is striking as the complicated villain Dr Marco, as bald as Nosferatu in dark glasses and snappy 60s black outfits, and simultaneously terrorizing a secluded jungle village while pining for his dying vampire love Katrina. 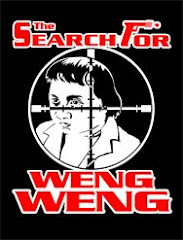 As well as a vampire, he’s a man of science and medicine, and with the help of his hunchbacked assistant and mute dwarf, he plans to transplant the still-beating heart of the village girl Charito into Katrina (both played by the gorgeous 60s Filipino starlet Amalia Fuentes). 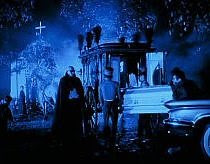 Modern technology and traditional faith are constantly juxtaposed in a film which cuts between colour film and black and white footage tinted in cool blues and blood red. 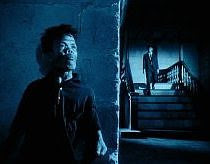 Apparently colour stock in the Philippines in the 60s was too expensive for an entire feature, but like the rest of The Blood Drinkers, director de Leon uses this budgetary contraint to full advantage. 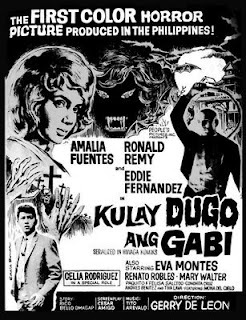 De Leon may fill the screen with Hollywood-inspired images of caped counts and rubber bats, but this taps into a rich vein of Filipino folklore littered with tales of evil aswangs and female vampires with giant bat wings called the mananaangaal. Add almost five hundred years of Catholicism, a Spanish colonial heritage and a countryside ruled by an almost feudal aristocracy, and the image of Charito’s undead parents trying to feed off her blood becomes so much more potent, as does the the overload of garish religious imagery.